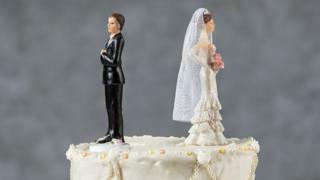 Divorce laws in England and Wales are set to be overhauled under government plans seeking to allow couples to split up more quickly and with less acrimony. Justice Secretary David Gauke, who has said the system creates "unnecessary antagonism", is to begin a consultation on introducing "no-fault" divorces. Campaigners said it could be a "landmark moment" for divorce law. In July, a woman's appeal for divorce was rejected by the Supreme Court due to her husband's refusal to split. Tini Owens, 68, from Worcestershire, wanted to divorce her husband of 40 years on the grounds she is unhappy. Her husband Hugh has refused the split and the Supreme Court unanimously rejected the appeal, meaning she must remain married until 2020. Under the current law in England and Wales, unless people can prove their marriage has broken down due to adultery, unreasonable behaviour or desertion, the only way to obtain a divorce without a spouse's consent is to live apart for five years. The government's proposals - first reported by Buzzfeed - could see the concept of fault, or blame, removed from the process. Spouses could lose the right to contest a divorce, as part of the reform. No-fault divorce would have been introduced in a 1996 Act of Parliament requiring spouses to attend "information meetings" to encourage reconciliation, but following pilot schemes, the government decided it was unworkable. There will be some who fear such a system will undermine marriage, but many believe it could remove a layer of stress and anxiety from one of life's most traumatic experiences. Speaking in the House of Lords, Baroness Vere of Norbiton said the call for reform after recent judgements had been noted and the lord chancellor was "sympathetic" to the argument for reform. "We are looking at ways to reduce conflict in a divorce, whether that can be no-fault, whether that can be under financial provisions, whether that can be for enforceable nuptial agreements," she added. Nigel Shepherd, chairman of the national family lawyer's organisation Resolution, said that couples had been forced "into needless acrimony and conflict" under the current system, "to satisfy an outdated legal requirement". "Today's news has the potential to be a landmark moment for divorce law in England and Wales," he said. "The government appears to have heeded our calls to make our divorce system fit for the modern age, and we will continue to push for this much-needed, overdue reform to be implemented as soon as possible." However, shadow justice secretary Richard Burgon said: "Instead of yet another consultation, the Conservatives should get on with changing our divorce laws so that they are fit for the 21st century." Labour was "fully committed" to introducing no-fault divorce proceedings, he added. Jenny from Kent got divorced five years ago. Her husband divorced her on the grounds of unreasonable behaviour because it was quicker than waiting for a no-fault divorce. "I would have been quite happy to wait for the two years so that we could have had a no-fault divorce," she told Radio 5 live. "The people that got caught in the middle of this were my two children because they went from seeing their parents talking and being quite amenable to each other to having real arguments and being quite nasty to each other - purely because of the process." Law Society president Christina Blacklaws said it was time to bring divorce law "into the 21st century". In Scotland, a simplified divorce procedure is available (to couples without children of the marriage under 16) where people can prove their marriage is broken down with one year's separation - with consent of both partners - or two years separation without consent. In Northern Ireland, the grounds for divorce are the same as the current requirements for England and Wales.